Does your pet struggle to cope with fireworks? It is estimated that approximately 45% of dogs do, which isn't surprising when you consider the loud noises and bright flashes they make. We are able to understand what they are and why the skies light up every November, but, to cats and dogs, fireworks are unfamiliar and threatening occurences. Many pet owners admit to being unable to help their pets cope, either because the pet's fear is extreme, or because they simply don't know what measures to take to reduce the fear. When we are fearful, we will often retreat somewhere quiet and comfortable - a safe space, if you like. Animals are no different and need somewhere similar to retreat to when things get too much. An important step in tackling firework fear is creating a haven or den in the home. This needs to be an area where your pet feels relaxed and secure. Maybe there's already somewhere your pet naturally gravitates to when feeling threatened or unsure. Make this space as cosy and comfortable as you can to encourage your pet to use it. If there's no existing area where your pet likes to go, create one! Use a bed or crate and fill it with soft blankets and cushions. Place your dog's favourite toy in there, along with drinking water. 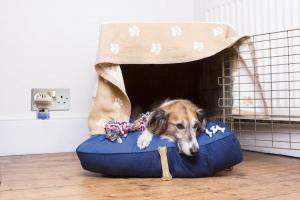 Ideally the crate should go under a table or a bed - somewhere slightly concealed from view - but if that's not possible, cover it with a blanket or bedsheet to provide some privacy and reduce some of the noise disturbance. The darker and quieter, the better. To make the den even more inviting, spray it with Adaptil (for dogs) or Feliway (for cats) to help promote feelings of calm and contentment. These products also come as room diffusers and have a similar effect. Pet Remedy has blends of essential oils which help calm the nerves of animals affected by firework fear. The plug-in diffuser is ideal for dogs, cats, horses, rabbits, rodents and birds. My dog's 'safe place' is the bathroom. It's her go to place when something has unsettled her. During firework season I leave a thick blanket for her to 'hide' in and one of my jumpers as an additional security and it works. She has been known to fall asleep. If it works for her it might work for others. My last dog was totally frantic during firework season and had to be tranquilised. Even then she would throw herself across the coffee table and once got stuck at the side of the toilet. Then we moved and had an airing cupboard in a windowless hall. It was warm and snug and she certainly benefited from not being able to see the flashes. These fireworks should be better controlled.